I took Ro to Uniqlo in Hong Kong so she too could experience the delights of its great jeans, colourful tops and bargainous prices. 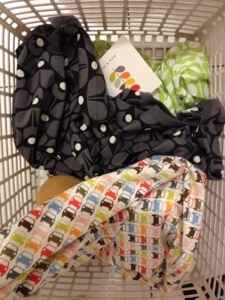 No sooner were we in the door than we were pulled, magnet-like, towards the unmistakable Orla Kiely prints. I didn't even know OK was doing a range for Uniqlo (launches in Europe on 19 March) but she is and you can snap up many of her signature motifs in t-shirt, vest and even slipper form. After a great deal of squeeing (and my discovery of the ultimate travel trousers, of which more later) we braved the back streets of Tsim Sha Tsui, but that's tomorrow's story. According to the website, they're not slippers, they're 'room shoes'. Niche market?